I used to love to play air guitar. I was flawless! The notes I pretended to play were exactly like the ones coming out of my stereo. Then I moved up to mid level yard stick guitar. I could do more convincing tricks with the stick, like knocking things over on accident. Then I graduated to the advanced level and started playing a tennis racquet. This was amazingly convincing because it had actual strings! Just like a guitar! Then I bought an actual guitar. None of my previous years of training translated at all. It was like I had to start over from scratch. I even discovered that I was air guitaring the high notes and low notes at the wrong ends of the neck. How embarrassed my stuffed animals must have felt for me. Today’s Maximumble is in the oval office. Oddly enough, Rock Band skills don’t translate well, either. Isn’t that the one where the controller is an actual guitar? “I even discovered that I was air guitaring the high notes and low notes at the wrong ends of the neck.” Me too : ( I’ve even had some training on a real guitar, but with an air guitar, high notes just seem like they ought to be further out. I have never played air guitar (weirdly enough, since I’m an avid heavy metal fan). We had to play the guitar in music class, and I was the worst “guitarist” in class. I couldn’t even do some simple chords! Good for Biff! 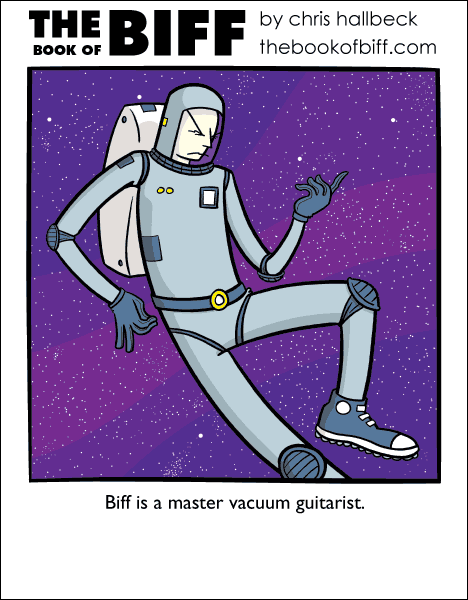 More astronauts should go for vacuum guitar training. I’ve been playing the violin for the past 6-7 years. Although the violin’s high-low pitches move in the same way as the guitar’s, I still find myself air-guitarring incorrectly. Most embarassing Air instrument: jaw harp.